As major events go, for many New Yorkers, Superstorm Sandy is beginning to feel like ancient history. The storm swept through the region in late October of 2012, and while we shouldn’t overlook those communities still rebuilding and recovering, large parts of the city were untouched by the storm’s destructiveness. Thus, there is no small bit of cognitive dissonance that arises when something major happens in the name of Sandy repairs. One of the ways in which Sandy has affected many New Yorkers who never saw the flood waters take out their homes and neighborhoods is, of course, via the subways. We’ve seen the images of flooded tunnels, and Brooklynites in particular have lived through R and G train shutdowns for repairs. Lately, though, other than work piggy-backed onto the 7 line weekend shutdowns for CBTC installation, it seems as though Sandy repairs in the tunnels have come to a standstill. (Other Fix & Fortify work not visible to riders has continued apace.) In April of 2014, we learned that the A and C trains’ Cranberry Tube would be the next to undergo repair work, and as late as November, the MTA had planned to do the work on 40 weekends throughout 2015. Well, here we are in late June with nary a sign of work on the 8th Avenue line. That’s about to change as the Daily News reports that Fix & Fortify work will begin on the Cranberry Tubes on July 11 and run for 40 non-consecutive weekends over the next 16 months. That means work on the A/C lines won’t end until the fourth anniversary of Sandy, and the MTA will still need to address damage to the F train’s Rutgers Tubes, the IRT’s Clark St. and Joralemon St. tunnels and, of course, the L train work, which might begin before the decade is out. For the MTA, the slow pace of construction isn’t a new problem. As we’ve seen with other capital projects, the agency can move only so fast, and during my Problem Solvers in March, John O’Grady spoke about the challenges the MTA faces. From the logistics of organizing various crews from various contractors to the difficulties of getting heavy machinery into tunnels built before the era of heavy machinery to the fact that it just takes a long time to move equipment into mile-long tunnels to the reality that only so many contractors are qualified for this work, the MTA can’t spend money as fast as it wants or we want. The report touched upon Sandy recovery work as well. By the end of 2014, the MTA had committed just 16 percent of Sandy recovery funds — $1.6 billion out of $9.7 billion — to actual work. The rest are in the design and planning stages, and a quick glance through the latest CPOC Board book shows work yet to be done. The MTA, of course, wants to spend money and build, but something — institutional, structural, bureaucratic — slows the pace. Sandy repairs are going to pick up again and again, but it’ll years until the system is healed. So long as another storm doesn’t sweep in while the MTA is fixing and fortifying, New Yorkers will adjust to the headaches of service diversions as we have regularly on the weekends for years. But don’t be surprised to hear New Yorkers express their own surprise that repairs in late 2016 or 2017 or even 2018 are related to Sandy. Time clears the memory of just what those floodwaters did. One of the many challenges currently facing the MTA involves the lingering damage from Superstorm Sandy. 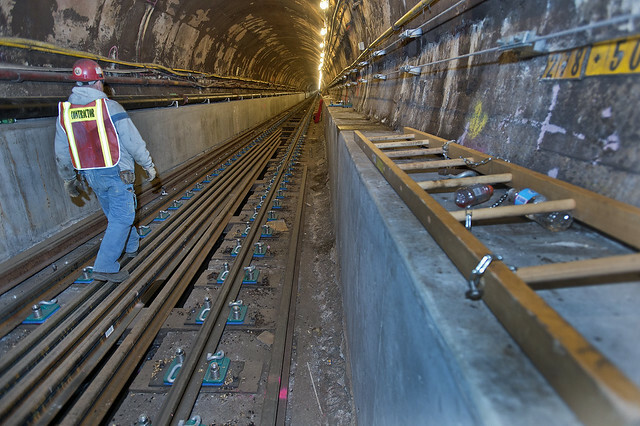 Although it’s been nearly 2.5 years since the storm and its surge swept through New York, the MTA has repaired only two of the damaged subway tunnels, and the rest are seemingly on borrowed time. The agency simply can’t spend the money fast enough and can’t take multiple tunnels out of service at the same time. So long as the infrastructure holds up enough, the MTA can make the repairs over the next few years, but it’s a battle against the corrosive effects of saltwater and time. 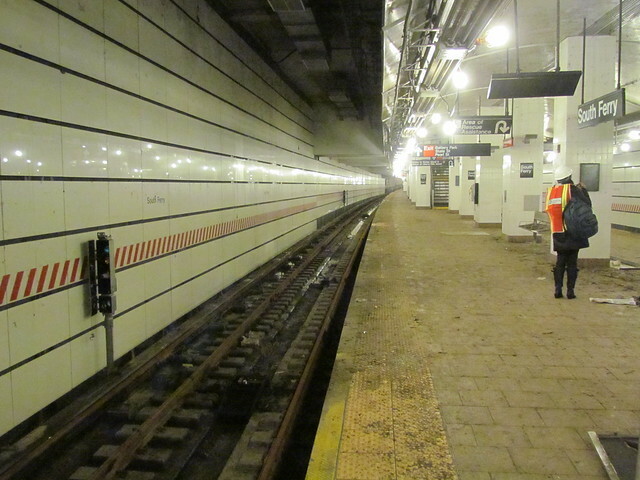 In addition to the tunnels, the new South Ferry station remains out of service. Although the MTA is officially hoping to reopen South Ferry in 2016, in all likelihood, as we’ve heard rumored, the station will remain closed into 2017. It needs a full rebuild and more as the MTA is working to solve some problems with the original construction and fortify and harden the station and surrounding tunnels. It’s a project nearly as expensive as the original new-build station was nearly a decade ago. But the money is on the way. Not that funding was in doubt, but in a statement released earlier this week, Senators Chuck Schumer and Kirsten Gillibrand along with Congressman Jerry Nadler announced $343 million for South Ferry, a new federal grant in addition to the nearly $200 million in federal dollars they had delivered last winter. This isn’t new money; the MTA had been expecting it as part of the Sandy recovery package. Still, it’s always a plus to have the cash in hand. Take a close look at that second sentence. The rehab work includes leak mitigation. This is essentially a tacit admission that the MTA’s contractors royally screwed up the job the first time around. Due to Sandy, the MTA has a do-over, but it’s not one they ever wanted. At least now, though, they can correct one mistake of the past, and as the federal recovery dollars continue to flow, I can’t help but wonder where this money is for the MTA’s capital plans needed for the future and not just those to rebuild after a storm. It’s hard to find the silver lining in the destruction to the subway system that Sandy wrought. Nearly every East River train tunnel was flooded, requiring millions of dollars of repairs and inconveniences that New Yorkers haven’t yet begun to imagine. A few weeks ago, though, we got wind of the MTA’s plan to use Sandy repairs to build a station entrance for the L train at Avenue A. The new entry point will make the 1st Avenue stop ADA compliant and provide access to the subway system for Alphabet City. That’s the good news. The bad news is that for the MTA to construct this entrance, they have to piggyback work onto Sandy repairs. As a few MTA sources have told me, in fact, this work would not be possible without the looming L train shutdowns that the Sandy repair work will require. Since parts of the L train are as crowded on the weekends as they are during the week, there isn’t a good time for the repairs, and as Sandy has receded into the past, it’s easy for Williamsburg, Bushwick and Canarsie residents to lose sight of the fact that substantial and lengthy repairs are on tap for their subway line. The MTA isn’t accepting bids on the BMT Canarsie Line work until later this spring, but a Subchatter has a glimpse of the bid demands. If this is the final request, it’s not a pretty picture for L train riders. As the document notes, the Canarsie Tube was flooded from essentially Manhattan to Brooklyn. The worst of the water damage occurred between Avenue D and the North 7th fan plant. The work includes demolition and reconstruction of over 36,000 feet of ducts; power cable replacement; communications system work; reconstruction of a pump room at Avenue D; and replacement of nearly a mile’s worth of track. That’s not going to happen in one FASTRACK treatment, and the MTA expects this $50 million contract to last 40 months. So what does this mean for L train riders? The damage to the Canarsie Tube was, by some accounts, right behind the R train’s Montague St. Tube and the G train’s Greenpoint Tube in terms of the severity, but the MTA isn’t planning on shutting down the Canarsie Tube for any long-term work. The demand for service is too great, and the parallel service is inadequate. There’s no 14th St. bridge for shuttle buses, and the nearest East River crossings are the 7 to the north in Long Island City and the J/M/Z ride over the Williamsburg Bridge. During the weekends, though, the M train will be expected to pick up the slack. In all likelihood, the M will run north through Manhattan via 6th Avenue as it does during the week, and those trains will be packed. It’s not replacement service, but it’s the next best thing. As of now, we don’t know how those weekend outages will be structured or how long the weekend work will last. But that’s what’s ahead for the Canarsie Tube when work eventually begins within the next few years. For more on the Sandy recovery efforts and the MTA’s Fix And Fortify program, check out my upcoming Problem Solvers session at the Transit Museum on January 27th. I’ll be interviewing John O’Grady, an MTA engineer, on the challenges facing the agency as it continues to recover from the storm. Tickets are free for museum members and otherwise cost $10. For the MTA, it’s hard to find much good in the outcome from Superstorm Sandy. 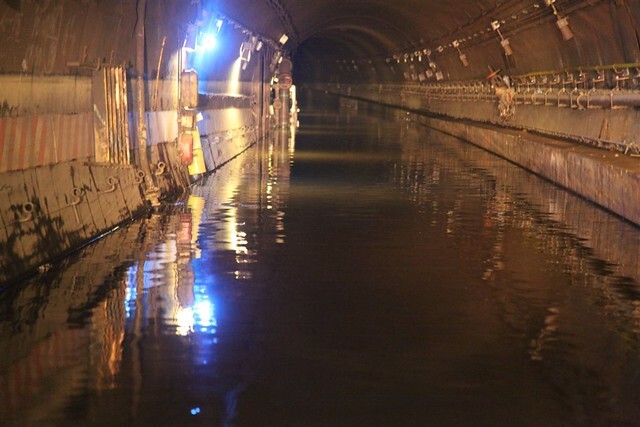 The saltwater that flooded the city’s subway tunnels significantly sped up an already-looming aging process, and the agency has had to spend federal dollars and manpower on restoration rather than, say, expansion. R and G train riders suffered through a lengthy service shutdown, and A and C train riders are in for a year of weekend service changes as the MTA rebuilds systems taken out by Sandy. But out of a crisis comes opportunity, and the L train is set to be the beneficiary of a bad situation. As I mentioned over the weekend, the L train is finally — finally! — getting an upgrade New Yorkers have asked about for years. The 1st Avenue station will get an entrance at Ave. A. It’s not quite as good as a new stop at, say, Avenue C, but as I understand it, the slope and depth of the tunnel make that a near impossibility. Rather, the MTA will improve access for both Alphabet City residents and disabled riders as the new entrance will be handicapped accessible. The work is part of a $300 million request to the FTA for Core Capacity funding. As L train ridership has nearly doubled since 1998 — the MTA cites a 98% increase over 16 years — the MTA is desperately seeking ways to handle the crowds. As part of the grant proposal, the MTA will add two trains per hour for an increase in service of around 10 percent, and the agency plans to add elevators at Bedford Ave. and a new street entrance as well. That stop has seen growth of 250% since the late 1990s and may see more yet. That’s an impressive figure for a line that could have been cut entirely in the late 1970s. So what does all this have to do with Hurricane Sandy? As the MTA noted in its press release regarding the funding request, the work at the 1st Ave. station will start first, and it will “be coordinated with planned repairs to the Canarsie Tube, which was flooded during Superstorm Sandy.” In other words, as a few people with knowledge of the situation have said to me, without the looming Sandy shutdowns for the L train, the new station at Ave. A wouldn’t really be feasible. The GOs for the L will enable the MTA to perform the focused work needed to build out a new entrance around a tight two-track line. There are still some questions surrounding this work. It’s not clear how much the station improvements at 1st and Bedford Avenues will cost or how much of the money is going toward the capacity upgrades. We don’t yet know the timing either, and considering the damage to the city, it’s hard to praise Sandy for positive results. But the MTA is seemingly making the most out of a bad situation, and for that, East Village residents can now look forward to transit upgrades. On Sunday night, at 10:51 p.m., a Manhattan bound N train left De Kalb Ave., and instead of rolling over the Manhattan Bridge, this N train took the long way. It stopped at Jay St./Metrotech, moseyed over to Court St. and then became the first train in passenger service since mid-2013 to ride through the Montague St. Tunnel. For the MTA and Governor Andrew Cuomo, who stopped by Lower Manhattan yesterday to mark the occasion, the reopening, two to six weeks early, was a sign of recovery from Sandy. It’s also a story of what the MTA can do with external pressure on deadlines. We’ll get back to that in a minute, but let’s journey first to Brooklyn. I took a walk from Park Slope to Red Hook yesterday afternoon, and part of my stroll took me underneath the Culver Viaduct. I’ve lost count of the number of years this thing has been under construction, and the original completion dates, laughably enough, were around three years ago. On a bright late summer Sunday, a few workers seemed to be contemplated the safety nets that still surround the structure as they climbed atop the construction shed towering over 9th St. between 2nd Ave. and Smith St. It seemed to be a project with no end and no impetus pushing it toward a finish line. Lately, local politicians have begun to notice that the Culver Viaduct rehab has entered that twilight zone of incompletion with little visible day-to-day progress, and they have begun to ask some questions. Brad Lander put out a statement on the project toward the end of August. A contractor default has put the finishing line out of view, and a quick glance at the 4th Ave. station makes it clear much remains to be done. 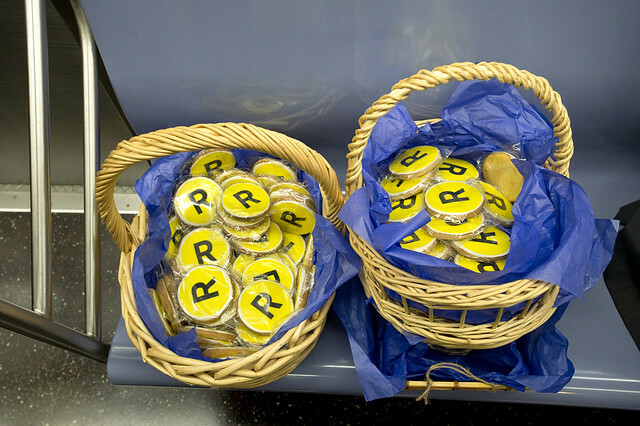 But now, let’s go back to Lower Manhattan, R train cookies and all. After a closure for a complete rebuild of the systems that line the Montague St. Tunnel, Gov. 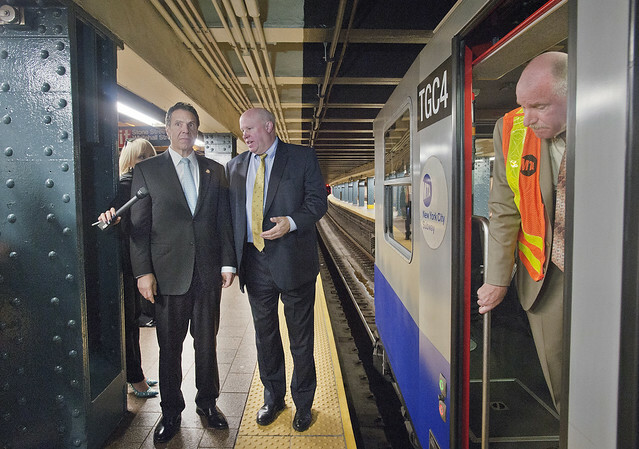 Cuomo and MTA dignitaries were on hand Sunday to celebrate. The Governor of course loves to take credit for the good while ignoring the bad (or even removing $30 million from the MTA’s budget), and he didn’t miss a chance for a good photo op this weekend. In a press release announcing the reopening — in time for Monday’s commute — MTA officials noted that the Federal Transit Administration funded the project and thanks Cuomo for “his leadership in making the MTA and New York stronger” after Sandy, whatever that entailed. As you can see, I’m more than a bit skeptical over Cuomo’s treatment of the city’s subway system as a way to earn easy headlines and quick political points. On a deeper level though, rebuilding the Montague St. Tunnel early, even by a few weeks, shows that in-house MTA projects with a driving political need can wrap on time. I don’t know if the MTA spent efficiently or wisely; I do know that by taking the tunnel out of service, the work wrapped on time and not, say, three years late. There are lessons to be learned here, but they require hard trade-offs. So far, the MTA and New Yorkers haven’t been willing to make those sacrifices, but maybe they should. After all, some of them can get a cookie out of it. For more scenes from Sunday’s event, check out the MTA’s photoset or shots from the Governor’s Office. I particularly enjoyed this one showing the branching of the Montague Tunnel into the BMT Broadway Line and the BMT Nassau St. line. When it comes to construction work, “early” is not a concept many people associated with the MTA. From staircase replacements and escalator repairs to the work on the Culver Viaduct to the 7 line or East Side Access, rarely is anything high profile finished early. We’re lucky, in fact, if something wraps on time. When it comes to post-crisis which for which someone else is paying (and that is, more often than not, managed in-house), the MTA seems to shift into gear. The five-week shutdown to the G train’s Greenpoint Tubes wrapped on time over Labor Day weekend, and now reports are circulating that the Sandy recovery work on the R train’s Montague St. Tunnel could finish early. The tunnel that carries the R train between Brooklyn and Manhattan — which has been closed for more than a year — may reopen ahead of schedule, according to insiders at the Metropolitan Transportation Authority. 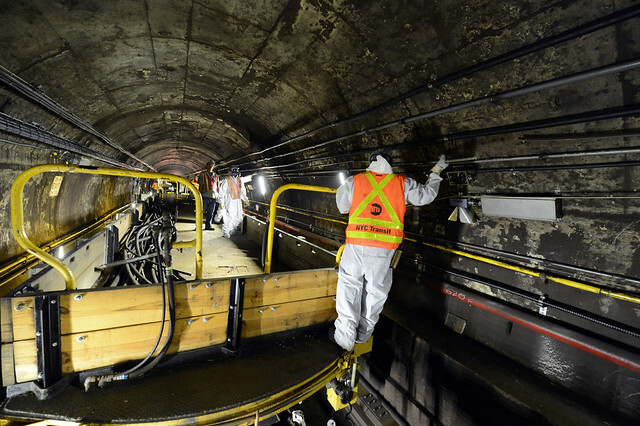 A staffer working to restore the Montague Street Tunnel said the tube, which was closed in August 2013 for post-Hurricane Sandy repairs, will likely be up and running before October, weeks ahead of its scheduled reopening. Speaking on condition of anonymity, the worker said the Authority has already begun sending track geometry cars — automated track-inspection vehicles loaded with high-tech gizmos — through the tunnel to make sure new construction is up to snuff, which is one of the final steps before returning a route to service. The MTA denied an early opening to the Brooklyn Paper, but a spokesman was more forthcoming to the Daily News. The project, Adam Lisberg said, could “meet or beat the October deadline.” Meanwhile, I’ve spoken to some MTA sources who say the tunnel opening early isn’t a matter of if but when. If politicians are interested in a photo opp ceremony, the reopening could be delayed a few days, but by some accounts, Montague St. is just about ready for revenue service trains. Now, again, it shouldn’t be newsworthy that the MTA is opening something two or three weeks early or even on time, but because of the way construction projects are handled, it is. We can applaud the reopening of tunnels shut due to damage from Sandy, but we should eye skeptically other work that can’t be completed on time. What takes weeks to fix an escalator? What takes over a year to wrap up new build work? Why are emergency repairs so much quicker? I can’t answer those questions, but someone — or multiple someones — should be looking into it before that ribbon-cutting for the Montague tube, whenever that may be. Greenpoint’s and Long Island City’s summer of their discontent came to end this morning as Transit restored G train service between Brooklyn and Queens. After shutting down the Greenpoint Tubes for Hurricane Sandy-related repairs in late July, the MTA celebrated wrapping the work on time this morning, and G trains will operate as they always do, sometimes more reliably than others, for the foreseeable future. 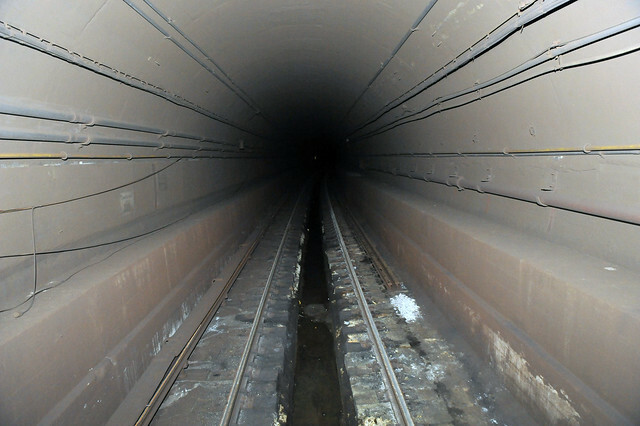 As the MTA has repeatedly noted, the Greenpoint Tubes suffered a considerable amount of damage during Sandy when three million gallons of salt water (and who knows what else from Newtown Creek) filled the tunnels that connect Brooklyn and Queens. Power cables corroded from the inside while rails and fasteners suffered significant damage. Ventilation, lighting and communications systems were all destroyed and still have not been fully restored. Still, service could resume today. The shutdown, of course, was not without controversy or questionable conclusions by regular riders of the G train who bemoan service many view as unsatisfactory. In an amusing piece of person-on-the-street journalism, DNA Info reported that some G riders preferred shuttle buses to the subway. The shuttle buses, after all, ran far more frequently, albeit at significantly lower capacities, than the G train did. Business though in Northern Brooklyn and Long Island City are happy to see the subway connection restored even if the G will be undergoing a FASTRACK treatment next week. Meanwhile, further south, the MTA is pushing to wrap up work on the Montague St. Tunnel by the end of October and will turn its attention to other East River tubes that suffered damage but will not require full shutdowns. As now, the MTA has simply said they will “will also address issues in other under river tubes to make the system more resilient.” Details should be forthcoming soon. Right now, a new tunnel is nothing but a line on a map. It’s hard to believe that it’s been over three and a half years since New Jersey Gov. Chris Christie unilaterally canceled the ARC Tunnel. Yet, it’s a decision that keeps coming back to haunt the entire region. Amtrak has proposed picking up the slack with their Gateway Tunnel, but that’s decades off. Now, questions have emerged concerning the region’s ability to cope with aging infrastructure and no replacement plans in place. The latest comes to us from Amtrak. As the two Hudson River tunnels creep up there in years, the national rail agency has warned that age will become a major issue sooner rather than later. Amtrak’s chief put their life expectancy at “less than 20 years” and urged everyone involved to start funding — and then building — Gateway. In addition to age, as Rubinstein notes, Sandy damage is going to play a big role in this tale. The Amtrak tunnels, by some accounts, suffered approximately half a billion dollars in damage during the storm surge, but unlike, say, the Montague St. Tunnel, Amtrak can’t just take one of their cross-Hudson out of service for a few months to make repairs. That would reduce capacity from 24 trains per hour to just six, and as Amtrak owns them, the people who would suffer the most from single-tracking would be New Jersey Transit riders. Thus, it all comes back to ARC as without ARC, New Jersey Transit is beholden to Amtrak’s whims. So where do we go from here? As with all of these major infrastructure projects, Gateway needs a champion, and right now, it doesn’t have one. It needs money, and right now, it doesn’t have it. Will we wait to fund it until it’s too late or will someone come to their senses before we have to live in an era when six trains per hour can cross the Hudson River? The clock is ticking.